You walk in a room and flip a switch and the lights come on. That’s all you really care to know, right? The reality is, you really should know more. Electricity touches your life in every way you can think – from your wallet to government policies and taxes, from weather patterns to the local economy, and more. It’s a complex topic — so let’s start with how electricity is generated and delivered to your home or business. This is the first in a series of posts that aim to simplify the very complicated utility business. 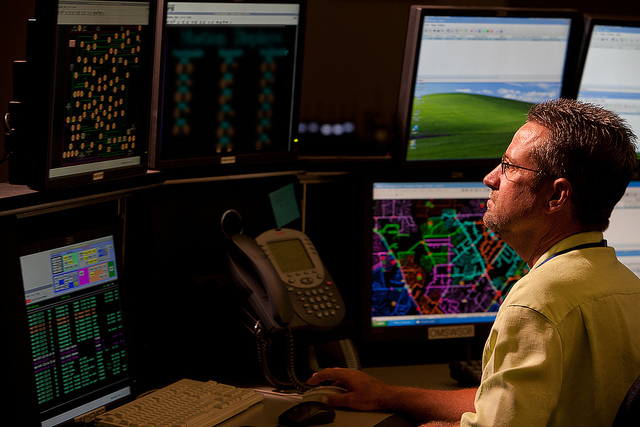 The control at CPS Energy, where system operators manage the energy flow 24-7. Finding a way to explain how electricity is generated and managed so that you get it when you need it is a challenge in itself. Metaphors or analogies can be helpful, but there doesn’t seem to be one just that adequately conveys the electricity generation and delivery process. So, I’ll just keep it as basic as possible. First of all, electricity is needed 24 hours a day, seven days a week. At night, traffic lights and street lights are still working; hospitals, police and fire stations, some restaurants, retailers, and manufacturers operate around the clock. The amount of electricity required at all times is called the base load. Utilities want to operate the least expensive generating plants for the base load. For CPS Energy, that’s nuclear and coal. Both coal and nuclear plants take a great deal of time to “fire up,” just like a charcoal grill. If you want to eat at 7 p.m., you need to fire up the charcoal at least a half an hour before that for it to be ready in time. This is another reason why coal and nuclear power plants make the most sense for base load: they need to be running at all times since they cannot be turned on quickly. We use renewable energy during the times it is available. As the need for more electricity increases throughout the day, coal and nuclear plants can gradually be ramped up to their maximum output capacity. Once they have reached their maximum output, or if there is a sudden rapid increase in demand for electricity, utilities cycle up “peaking units” for short-term increases, or peaks, in demand. For CPS Energy, these are natural gas turbines. Renewable energy, such as wind and solar, gets mixed in throughout the day and night, when it’s available. Since there is presently no cost-efficient way for us to store energy, we have to use renewables as they are available, when the sun is shining or the wind is blowing. Now imagine that each one of these electricity sources is a liquid being pumped into a pipeline and the diameter of the pipe will only hold so much at a time. Someone, somewhere has to keep track of all these different sources and make sure there is enough in the pipeline to meet the need or demand, but not so much as to overload the pipeline and cause a rupture – or in electric terms, an overload. 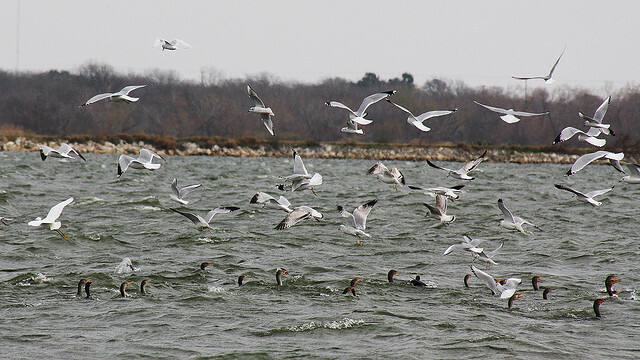 CPS Energy’s natural gas peaker plants double as bird habitat. The people who monitor the pipeline are called system operators, and that is what they do: operate the system. The operations center looks very much like an air traffic control center, but instead of planes coming in or going out in every direction, it’s electrons. This team has to monitor the amount of electricity on every line in the system, send out orders for more if there’s not enough, and send alerts to hold back if there’s too much. All the while, hundreds of people at dozens of power plants – wind farms in south and west Texas, the South Texas Project nuclear plant outside Houston, the natural gas plant in Seguin, and the Braunig and Calaveras coal and peaker natural gas plants – are working to make sure that the right amount of electricity is generated and transmitted onto the power lines. That’s just electricity generation. How the electricity is delivered – the transmission and distribution system and process – is just as critical and just as complex to your always-there energy. There is one other thing I care about, it happens every month. I get the bill. One of the reasons this concerns me so much is that I have so little power (pardon the pun) to control the bill. Your post hints that it’s cheaper to provide power when the sun is shining, but I don’t get a break on my bill if I turn my air down in the daytime. Is the issue of time of day pricing coming in a future post? Melanie,Thanks for your comment. We do not have a parogrm like that at this time, but we are always evaluating customer parogrms that provide you value beyond your electricity service.Your TDSP may have an energy-efficient parogrm that you might be interested. Which TDSP do you have?First Choice Power offers dozens of no- and low-cost energy tips as well as some that have higher upfront costs and thus higher efficiency possibilities at .Thanks again for your post. That’s a great idea. A lot of utilities are turning to time-of-use pricing as a price signal for customers to use less power during peak times, and be financially rewarded for it. Until CPS Energy has installed smart meters, we can’t do time-of-use. Our smart meter roll out is planned to begin next year (we have a pilot underway that thus far has shown great results); after that, I know we’ll be considering a number of different pricing options. There are other ways to save on your bill now, like bumping your thermostat up a couple degrees in the summer, and using a programmable thermostat — that can be a big savings right there.